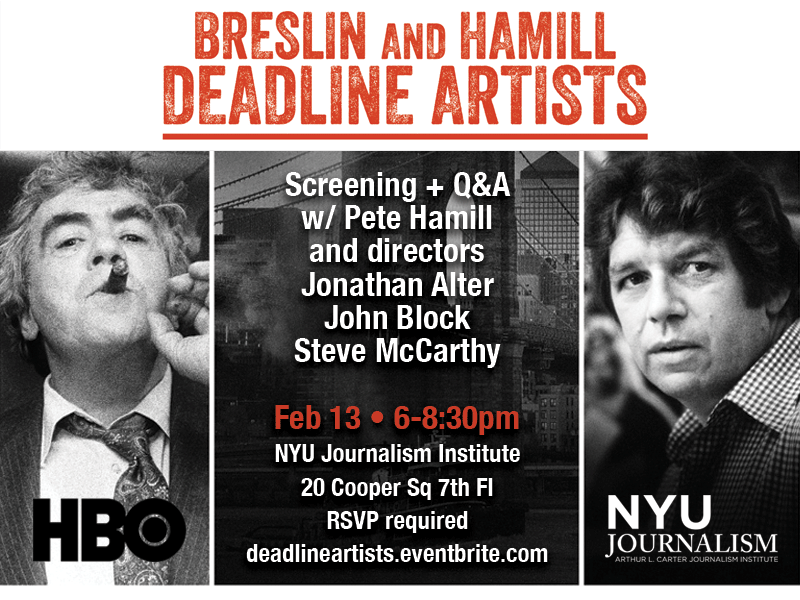 Jimmy Breslin and Pete Hamill’s brilliant, honest and courageous writing defined New York City journalism. For five decades, these colorful columnists and longtime friends spoke for ordinary people and brought passion, wit and literary merit to their reporting on their city and nation. Their writings probed issues of race, class and the practice of journalism that resonate powerfully today. "Breslin and Hamill: Deadline Artists" explores the famed writers' intersecting lives and careers while celebrating New York’s grit and charm during the last great era of print journalism. • Free for the NYU community. Must register with valid nyu.edu email address and show proof of ticket (digital or print). • $25 for all non-NYU registrants. Must show proof of ticket purchase (digital or print).